This is a bit of a catch up piece about a trip I made with work, way back 2015. I had an awesome time and took some great photos I’ve been meaning to share with you all. Enjoy. One day back in October, while I was at work, I got an email from a collegue asking if I was free in a couple weeks. I was really confused, so I phoned them up to find out why they were asking. As it turned out, there was some training happening in Spain and I was invited! I’m always keen for professional development and the opportunity to have an immersive experience to improve my Spanish language skills was one that I couldn’t turn down. 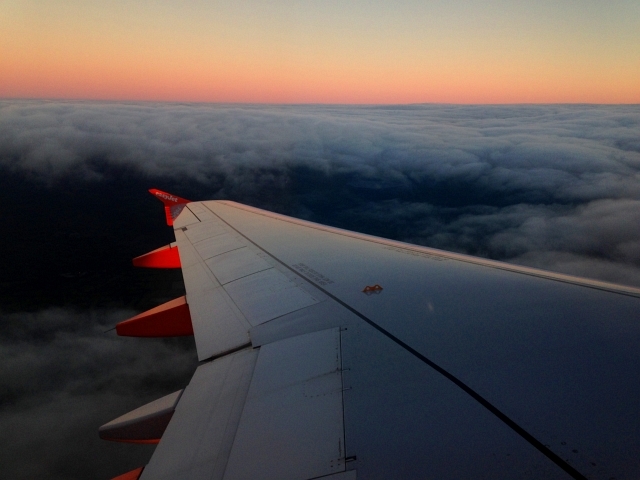 I’d normally spend a while saving for a trip but luckily, as it was for work, it was all funded and we didn’t have to pay for our travel, accommodation or food. I didn’t know many of the team of 8 of us that would be travelling to Salamanca but I was still super excited. Needless to say, I snapped the opportunity up straight away! We flew from Bristol to Madrid then got a private bus transfer to Salamanca (which was a couple hours away). We arrived in Salamanca late that night and checked into our very posh hotel. When I awoke in the morning, I was greeted by bright blue Spanish skies and a lovely buffet breakfast. 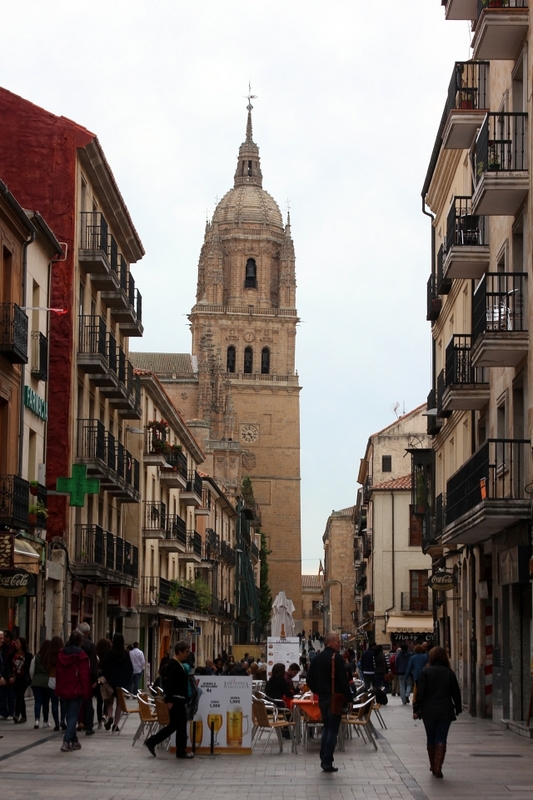 Excitedly, we went out to explore the city of Salamanca, heading first to the Square. 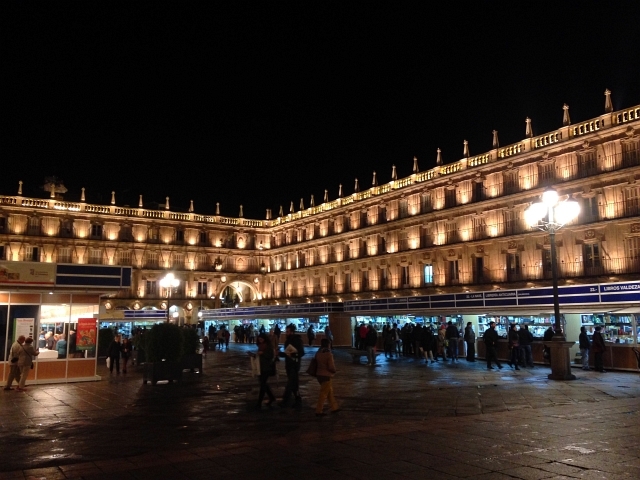 If there is one place in the city that you need to see, it’s the Plaza Mayor, the central square. This place is really lively during the day, full of people meeting for a coffee or lunch in the sunny terraces. At night, it’s the place to go out partying. If you have ever been there then you would definitely agree that you will surely agree it’s one of the most beautiful squares in Spain. 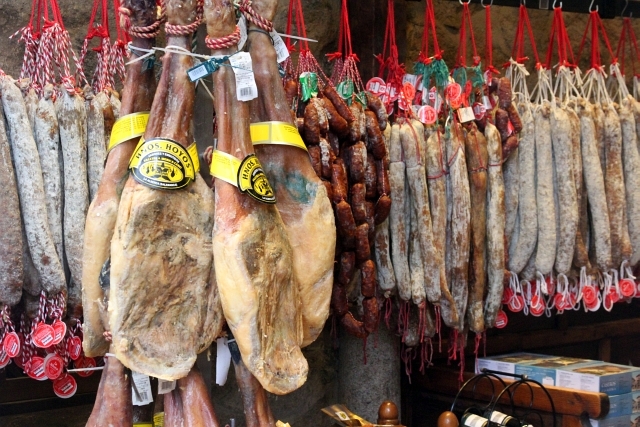 Ibérico cured meats are the food that Salamanca is famous for, so if you do visit, make sure you don’t leave without sampling these mouth-watering delicacies. There are loads of delicatessens found in the city centre where you will find a wide range of cured meats, hams and other products. Ibérico cured ham is made by a master craftsman and sliced very thinly by delicatessen staff. It is often served to you in very simple dishes, such as on artisan bread. I hadn’t heard of Salamanca before, but I quickly learned that it is part of the Spanish region known as “Castilla y León”. Despite being the biggest city, it’s famous around the world for its culture and for its student atmosphere. 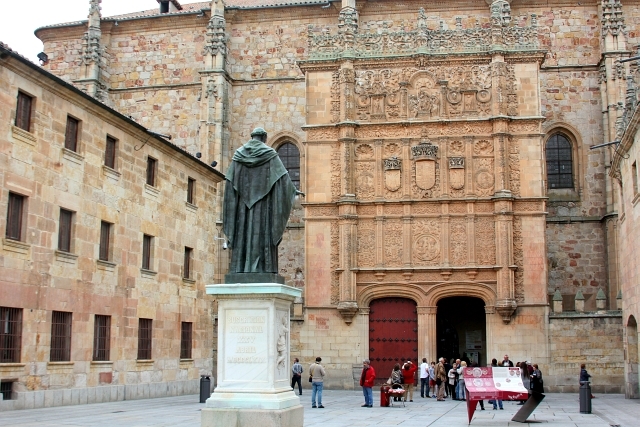 Founded in 1218, the University of Salamanca is said to be the third oldest University in Europe. Located in the western area of Spain, close to the border with Portugal, Salamanca is in the inner part of the country, nowhere near the sea. 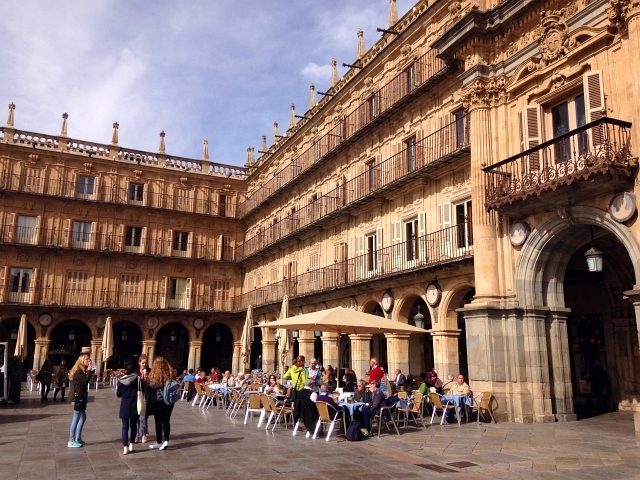 When you walk past Salamanca’s many ancient buildings or go strolling through its streets, you will find a city with a rich past. To me it felt like walking in a city of the Middle Ages. If you go sightseeing in Salamanca, you cannot miss a visit to the famous façade of the University, where you can try to find the “frog” which is supposed to bring good luck to those who find it among the rich decoration of the carved façade. It took me ages to find it, as it was so small and located in such a massive and intricate stone design. Just look at the photo below! 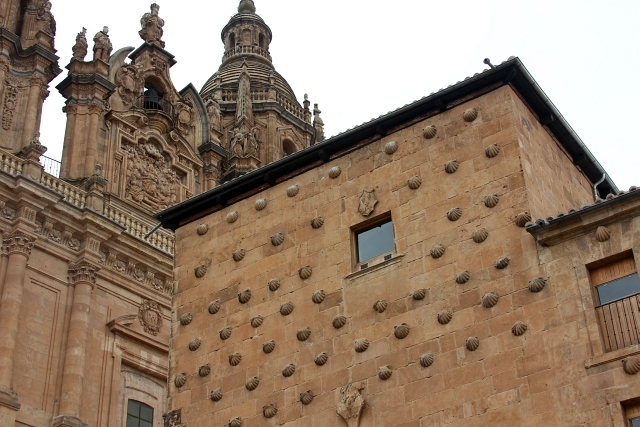 Another landmark that you need to take time to see when in Salamanca, is The House of Shells. Also called the Casa de las Conchas in Spanish (which sounds a lot better in my opinion),built during the 15th century. If you were to count them all, there would be roughly 400 shells on the outside of the building. Apparently the shells are either a symbol of love or just an ornamental addition to the exterior of the building. I’m going to Salamanca next Spring(2018)- my second time there. What hotel did you stay in ? Close to Plaza Mayor?